So, I’m trying to replace my helmet. My present helmet (a Met helmet) is getting pretty old, and although it looks okay, I think it’s time for a new one. After looking at the Lazer helmet on the Net, and thinking that it looked like fun, I went to try it on. 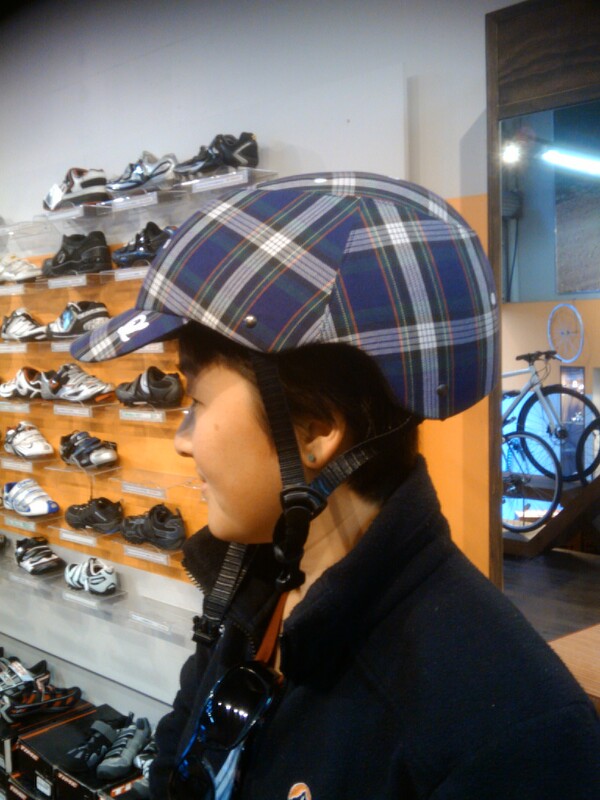 The Lazer helmet is like a skatey type helmet, with a fabric cover and a brim. It comes in a selection of colours (black, khaki, black tartan, red tartan and blue tartan) in a one size fits all approach . My first impression was that the helmet was heavy. Really heavy. And at 430 grams, I guess it is. It feels like wearing a horse riding helmet. It’s held on by a retention system at the back of the helmet, however the helmet itself is quite wide (as it’s a skatey helmet). 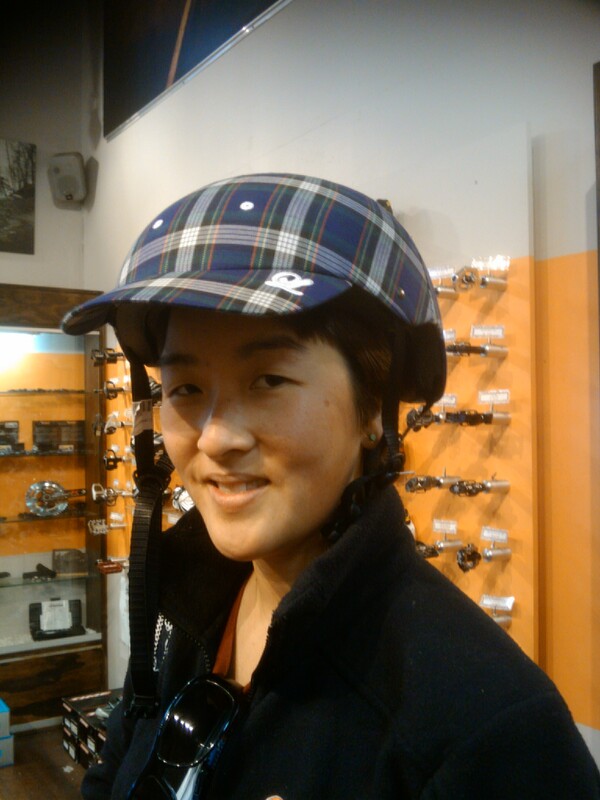 I have a weirdly shaped head – I think it’s more oval than round, so I found that the helmet gapped a bit at the sides. Nothing too drastic, and the retention system held it on well enough, but it was still noticeable. 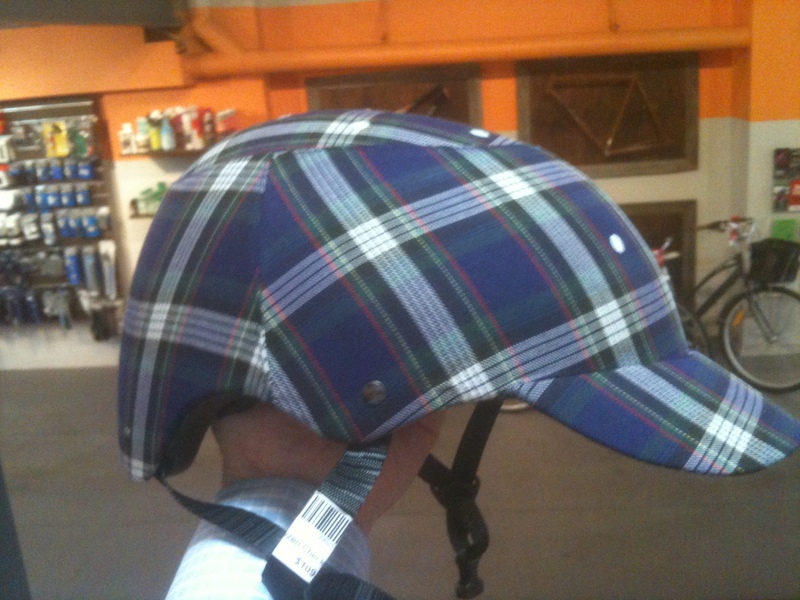 The brim is reasonably soft (stays out, but not super stiff) and folds up, which is good in case you are in a stack. The helmet looks cool. Seriously cool. I really wanted a Yakkay helmet, but until they are approved in Australia, this is a good alternative. The helmet is hot. There are only little vents at the top of the helmet and these are covered in fabric, so ventilation is minimal. It would be great in cold areas – but I’d hate to be wearing this if the temps were over 25 degrees. I really like the look of this helmet. It’s stylish, doesn’t look like you are trying to win the Tour, and is fun. Yet the weight of the helmet and the lack of ventilation makes it inappropriate for longer rides. Overall, I think this would be a perfect helmet if you were going for a jaunt up to the shops to, or getting on your cruiser for a spin on the beach, but for longer rides, or in hotter climates, I think the jury is still out. Just for the record, I didn’t buy it. I’m still deciding. This entry was posted in Reviews and tagged Bike Fashion, Review by On two wheels. Bookmark the permalink.